March 1st, marks the first day of the month and you know what do! If you haven’t ever heard of this tradition, please feel free to check it out here! 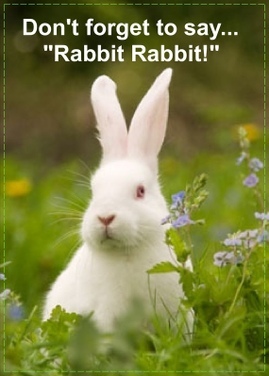 It always makes me smile to say Rabbit Rabbit on the first of the month. And speaking of smiling, because it’s Caturday, I want to send you a giggle I found this morning that’s guaranteed to make you smile today! It takes less than a minute. Please, indulge me. Everyone deserves to find their smile today! After all, you might think you know someone, you believe you know what they’re saying and when you’re just not looking, you might not believe how they are talking behind your back! Has this ever happened in your house? Do you know for sure?